All the rage at parties is hiring a photo booth for your guests. 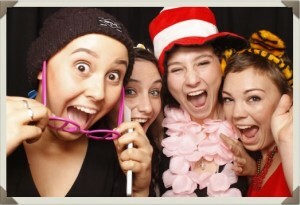 Photo booths are perfect for keeping your guests entertained throughout the event. The photos (strips) are a perfect gift at the end of the party for your guests or a replacement for your party favors. And the best part…with the guestbook, at the end of the night, you have an instant, personalized memento with pictures and messages from your guests for you to enjoy for years to come! Guests from ages 7 to 70 will all enjoy the photo booth experience and take home a momento that will be long remembered. Whether you are having a wedding, bar mitzvah, sweet 16, corporate event or any occasion, rent a photo booth and instantly turn your event into one that your guests will always remember! You can hire a classic photo booth or a modern-style booth, all of which produce photographs of your guests for you to share and keep.